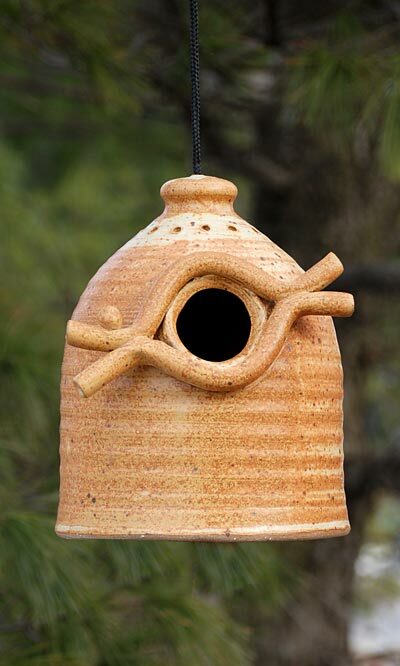 Create a dramatic roost for birds in your garden with the Anthony Stoneware Bird House. Two large rods encircle the entrance hole, adding interest to the home and offering birds perching room. The house is formed of clay rings that taper as they reach the top, bringing texture and movement. Ventilation holes surround the top of the home, and three large holes at the base help water drain and keep the nest dry. The 1.25" diameter entrance hole is perfect for small songbirds. A removable plug at the bottom of the item allows it to be cleaned easily, and the included black fabric cord enables it to be hung. The tan color with brown speckles adds a natural feel. This home is handmade from ceramic and then fired to 2400° Fahrenheit, to create a durable vitreous product that will withstand the rigors of time. The item will not decay, fade, or break down after exposure to UV light, for a long lasting unit. Enjoy birds in your garden with this Bird House. Made in the USA.